Big serve hits the line and skips into Djokovic's face, and he can't return that. An absolute volley of abuse for the offending service line from Djokovic. Djokovic none too pleased with somebody calling out during a shot, to which James Keothavong issues the usual "please remain silent during the point" warning. Tepid applause from a Centre Court crowd who feel a little bit like naughty schoolchildren all of a sudden. Federer has 18 aces to Djokovic's seven. Super casual shot into the empty court from Federer to move 15-0 up in the next game. Federer approaches, ball goes long. Game Djokovic. That was all a bit bizarre, like the tennis equivalent of Lemmings. Now Djokovic rushes in and volleys long. Just stay back, boys! And that's three in a row. Federer runs in, Djokovic passes him. 40-0. He does it again, and Djokovic doesn't win the point immediately, but digs out a wonderful cross-court winner with the next shot. 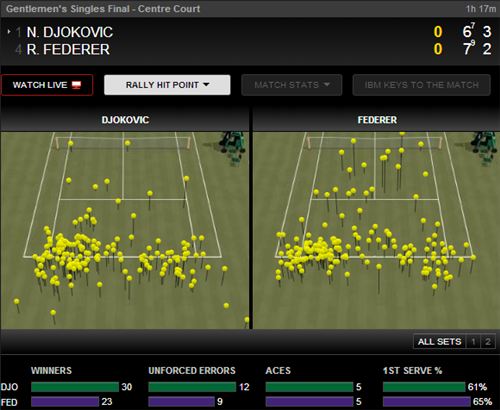 Federer rushing in on the Djokovic backhand has brought approximately zero success so far today. He persists and loses the first point. 15-0. A hold to love for Federer. 5-4 in the third set, and Djokovic will need to hold serve to save the set. Two hours in, one set each, 4-4 in the third. It's a bit even, isn't it? A hold to love for Djokovic. He's still not been broken in this final. Phenomenal whipped forehand from Djokovic dips onto the tramline on the left and he moves 15-0 up on his serve. Great shot. Federer cranks out ace No.13, has a mutter to himself about something, and advances to 40-0. A running passing shot from Djokovic brings it back to 40-15, but a wonderful drop volley from Federer wins the game. 4-3 Federer, third set. That ball landed smack on the baseline at Djokovic's end, the call of "OUT" went up, Djokovic mishit it and then the correction came. The point is replayed and Djokovic wins it. What could have been 0-30 for Federer on the Djokovic serve is now 15-15. Ah, controversy. A correction from the chair umpire and Roger Federer is pretty furious. He hasn't changed them yet, doesn't have time at the change of ends. He'll serve with the old ones on. New shoes for Novak. He needed those in the semi-final against Grigor Dimitrov too. Ace for Federer, 3-2 lead in the third set, going on serve. Faultless stuff. Fine volley at the net from Federer to move 30-0 up in his next service game. Shall we just fast-forward to the tie-break now? Djokovic with another straightforward hold. He has been virtually untouchable in that respect today. Honestly, these first three games of the third set are a little like in the second set - a phoney war. 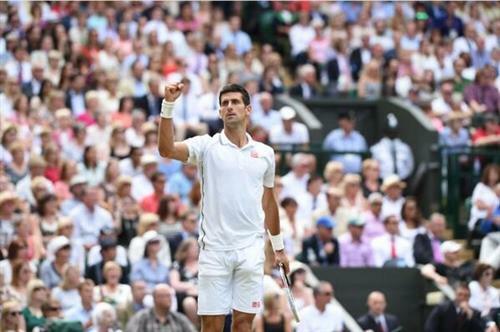 Djokovic broke in the fourth game last time - can he stave off Federer this time? 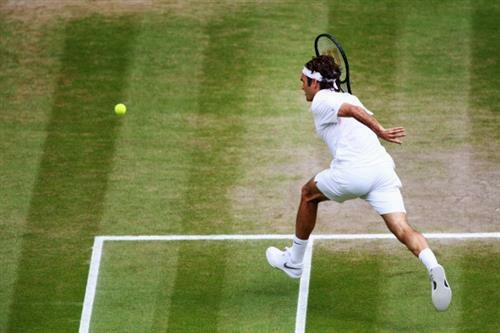 Federer holds to love, and reaches double figures for aces in the match in the process. A hold to 15, and Djokovic is not at all perturbed by these net-rushes by Federer on his second serve. He's picking them off all too easily just now. Federer holds in his first service game of the third set. Djokovic is racing through his equivalent now. Quick toilet break for Novak, who gets maybe one clap from the crowd on his return to court. Centre Court is Roger Federer's, for sure. The main statistical difference in that set compared to the first is that Federer's winner numbers dropped from 17 to 11, while Djokovic's held relatively firm at 17 from 18. There is barely anything between them in this match though. Overhead smash, second set Djokovic! Ace from Djokovic. Set point. Djokovic makes amends, faced with a very similar shot in the same area on the very next point. He smashes it away and it's deuce. And then misses an even easier forehand mid-court to give Federer break point! Federer holds to love, with two aces. After the change of ends, Djokovic will serve for the second set, leading 5-4. Djokovic holds to 15, despite a slip in the exact same area of the court that caused his visit from the trainer earlier. Federer now serving to stay in the second set, trailing 5-3. Roger Federer is 13-2 when winning the first set of a Grand Slam final, including a perfect 5-0 when that first set goes to a tiebreak. Incredible stat alert: Djokovic is WINNING THE SERVE VOLLEY BATTLE! Smashing forehand from Djokovic is a clean winner and he gets to 30-30 on the Federer serve. Two serves later, and the game is done, a Federer hold to 30.